Hyper Light Drifter was a very emotional project to work on, and I think part of that was because of the creative approach I took with the music. I ended up trying many things that didn’t work, and so I often had to start over in the middle of an idea. The game kept shifting over my three years of involvement, and I didn’t feel like I had a grasp of the game until the very end. It's odd - the very first thing I wrote for the project ended up being a seminal representation of the spirit of the score, and yet the general experience of writing the music proved to be quite a struggle. Being on the same project for three years is difficult for someone like me, where I feel like my taste and my interests are always changing. The level of trial and error in finding the right sounds for this game was quite high, and required a lot of energy of me to stay engaged and working at my highest potential. I often felt like I was using my emotions to figure out what was working and what wasn’t, and that ended up being taxing over time. By the end, I was reaching back into the past to try and channel how I used to feel, because I think I’d already kind of moved on from it. But I couldn’t quit. I had to finish it. There was definitely some cross-pollenation when it came to influence. We landed pieces like 'Titan' and 'The Abyss' pretty early in development, which I think helped the team's creative process. I was absolutely inspired by the visuals, as that was the first thing I saw and reacted to in writing some of the earliest pieces. I also got really into Miyazaki's Nausicaa manga during development. That definitely helped me down the stretch. I stumbled into an impressionistic way of approaching the music for Hyper Light Drifter. I improvised at the piano often as I was trying to hone in on some very subtle feelings and vibes for different areas of the game. There was a lot of trial and error, naturally. In the eastern water region, the music is placid and serene, but with a tense edge that comes through at different points. I had some semi-intuitive notions of how that type of region was supposed to sound, and I tried to lock into that. I used that process with every region of the game, more or less. I had to figure out the sound of a post-apocalyptic desert where it’s raining all the time. What does that sound like? What’s the sound of a crystal forest, or the sound of ascending a mountain? It became harder to make progress late in the development, so I amassed about 100 piano ideas that I felt could fit in the game. Alex, the creative director, and I went through all of them and made notes about where we thought certain pieces might work. That helped to figure out what kind of music we need and where, and in coming up with themes. I wrote a title piece early on, and it was nice but didn't turn out to be the right fit for the game. Then Alex heard a short sequence of chords in one of the other piano sketches, and it immediately clicked with him that he had found the theme, and I agreed. I was originally thinking of using it for a deep, cavernous level, but it captures the dark, haunted, adventurous quality of the game very well. Part of what happens when I try to write themes, especially on the piano, is I tend to write these through-composed pieces with lots of sections. Then, when I try to bring it into a synth environment, it tends to sound overwrought, too complicated with too many parts. So, we went from a theme that was sixteen bars long to a theme that is three chords. For a long time, this was just one of many piano sketches I was considering using in the game. 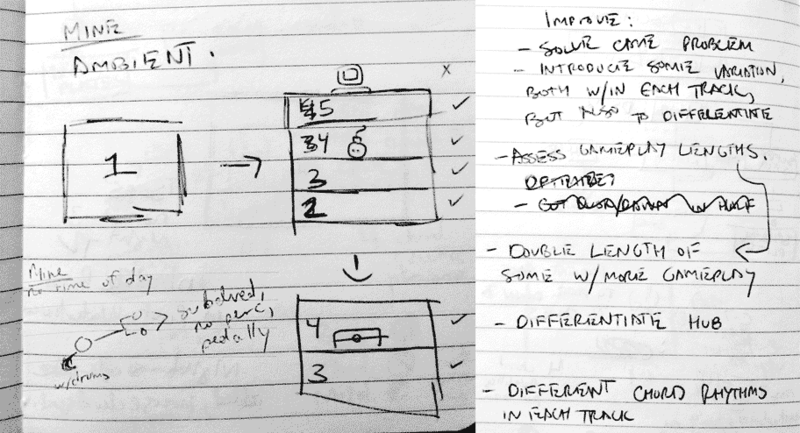 Alex Preston (creative director of Hyper Light Drifter) was very much involved in my process, and he helped keep me on track, especially towards the end of development when the project started to become more emotionally challenging for me. I think I had been using this piano sketch in the credits, and he suggested we use it in a trailer. Using music that seems unfitting has worked quite well in past game trailers, and lately, it has become quite trendy to use pop music in game trailers to tie the emotions of a fantastic world to reality. I think this approach generally seems to work, and we felt like this was accomplishing some of the same things. After going through numerous attempts at writing theme music for the game, Alex once again steered me in the right direction, honing in on just three chords from one of my piano sketches that he thought could be the game's theme. We ran with the idea, and it became a crucial element of the score which we used in one of the trailers, the final boss fight, and this piece which is the game's intro. This is one of the first pieces I wrote for Hyper Light Drifter. Alex took the game to Minecon, the Minecraft Convention. Originally I had intended to create four variations on this theme (the tower theme), one for each of the four cardinal directions, but it turned out this version worked fairly well no matter where you placed it, so I never elaborated on it. It does show up in the final area of the game too though (The Abyss), to try and consolidate everything together. This track was based on a piano sketch, and a bit more lively and energetic at first. I originally had a more ambient version for interiors (i.e.,. the Drifter's bedroom), but Alex felt like the more ambient style worked better, and so we agreed to move in that direction. The darker portion of this track is the variation I wrote for the 'Dregs,' the levels that connect the Central town to the 4 cardinal regions. We developed tech to have elements of the music exist at points in space, but we never really used it. The one place we did was in Central. A little guitar player fashioned with the Disasterpeace skull for a head does a little improvisation along with the underscore. This was the first time I think we were really able to create a piece that fully captured the essence of the game. This was written as an escalating, melodramatic piece with a thematic send-off, for the 2nd trailer. This started as a series of variations on a piano idea that involved overlapping hand patterns and an interesting harmonic progression. I wrote more variations of this piece than any other in the game (except the Gauntlet), and I think this improves its listenability as you are wandering through the opening section of the West. This chord progression started as the 'underground' part of a larger piano sketch that was meant to represent the West in its entirety. I ended up not using the whole idea because it had too many changes. I kept this section because I thought it captured the vibe of a deep place that I wanted. This area of the game is a prison (as you might have guessed). As the second variation begins and adds percussion, the intent is to create a sense of confrontation. This reaches climax towards the end, to match the intensity of the final battle. This is one of the only tracks on the soundtrack with an acoustic source (a piano). It's also one of the most improvised. I laid down a basic groove and tonality and had fun putting different sounds over the top of it. This piece starts with the Jackal's recurring motif, just as it does in the game. This area of the West is heavily patrolled and felt to me like a base of some kind, so I wanted to create a piece that was heavy on percussion and had a bit of a militaristic vibe. I actually ended up repurposing a sketch for an earlier section of the West as I thought it worked better hear. The piece ends in an ethereal, atmospheric way to set up an eerily quiet traversal from the base to the final battle in the West. I originally wrote something else for this boss fight, but it wasn't working. Alex guided me a bit with this, showing me a boss fight from Dark Souls with a giant wolf that had a melancholy quality to it. I used that as inspiration to write something that had a bit of a 'fallen hero' quality to it. This piece came together in an unusual way - the beginning of this track was actually written afterward as elements to fill in the spaces between the musical elements that happen on the stronger beats. The finale was written for a chaotic battle at the top of the mountain from a very early prototype. This encounter was simplified later on, and for a while, the music was hitting the intensity level desired better than the battle itself. In that way, the music actually inspired the gameplay at the top of the mountain. This piece came together very quickly and leans heavily on the sounds themselves, which often came first. Because this piece is very sound-centric, the resulting music was written specifically for these sounds (instead of vice-versa, which was also an approach I used at times). The 'swarming' sound in this track was designed early on for a battle on top of the Northern mountain that no longer exists. It was meant to reflect the concept of the cult birds, swarming around you. I think this sort of buzzing sound worked well in creating a kind of tense, and yet ambient environment. This track also features a MIDI Script I developed called 'Tremolo-ADSR,' which allows you to replicate crescendo accelerandos like the ones heard in traditional Japanese music. I used this to kind of sell the religious/temple vibe a bit further. That and FM bells! I created two very similar versions of this piece for two areas of the North that were laid out differently. There is a dry, narrow version for a region that is full of narrow brick pathways, and a bigger, wetter version for a library that leads to the final battle in the North. I think I was fortunate in that I was able to write the boss music finale in the exact same structure as the much slower feeling sections leading up to it, by subdividing the tempo. Castlevania was a definite influence in trying to get the right harmonic vibe for a very dark, cultish environment. In setting out to create a vibe for the East, a pale, watery place of pathways and waterfalls, long drawn out airy notes and bells were the first things that came to mind. Some of the wind instruments also do their best animal imitations, with plenty of portamento and diving pitches not unlike the sound of a mourning dove. There are also some rather large set pieces in this environment, remnants of millennia old Titans, and those were a perfect backdrop for the distorted colors in this piece. Generally, when things get quieter and wetter sonically, we are heading underground. The music is extra wet in the underground sections of the East. I had a lot of fun with the drums on this piece. While still quite ambient, it was a nice reprieve to have a much more percussive piece. I stumbled onto a tom-type sound in Alchemy (soft-synth) and leaned into that patch to make it more closely resemble the drum sound of Danny Carey of the band Tool. I loved this sort of athletic tom-heavy drumming, and this was one of the central inspirations of this track. The main pad riff features a slowly evolving delay unit that pitches the material up continuously to create what end up sounding like peculiar harmonics. I push this as far as I can, especially towards the end of the piece. Many of the east pieces started out as placid, Satie-like piano sketches, and I had to go back and try to darken them up to match the difficulty of these levels. Many dynamic layers were added to this piece after the fact to make it more intense. I originally wrote this piece for the plaza/town area of the East, but Alex and I were at odds about this piece. It was one of my favorites and one of his least favorites, so I ended up extending out 'Cascades' instead, and using this piece for the Sunken Docks. I think it ended up working well there because it's one of the largest, most open areas in the East if not the whole game, and there are very few enemies, which I think gives the music a lot of room to establish a setting. Part of this scene is a giant titan head floating in the water, which comes up in the middle of this piece. There are crackling noise sounds and deep percussion to try to give weight to the vision of this titan's head, and to imply that it goes way down below into the depths. This is capped off with a late add, a more active, percussive version of this idea to go along with a chaotic battle. This area starts kinda small with just a few frogs, and so I complemented that feeling with some dueling melodies. As the region opens up and gets deeper, the leads give way to material that is more rhythmic, eventually emerging from the depths into a drier, more intense march type variation as you fight all sorts of enemies. As the clash subsides, the music recedes into wispy pads, representing a memory of what has just transpired. This is a piece came out of a series of piano sketches that I stitched together, followed by overdubbing additional ideas on piano. I then spent a long time splitting out the various elements into a full arrangement. I wanted this piece to feel patchworked with lots of different ideas and patterns, hoping to give it a circus quality. This area of the East feels a bit smaller, and not as decrepit or foreboding, and so this piece I think has a lighter, upbeat quality. The underground battles get rather intense, so I ended up having to revisit that section of the music and add more variations to it. Another piano sketch, this one came to me late in the game. The South had an unusual structure to it, and kind of came together from pre-existing material, such as 'The Gauntlet', which was originally written for a 30-minute demo we made for Kickstarter much earlier. Much of the South is constructed from the levels of that demo, and so we did the same thing with the music. 'Petrichor' was a new piece that I added later as the overworld theme. We initially used the tower motif here (Wisdom's Tragedy), but it didn't make sense to have the tower theme playing when the tower only takes up a small part of the overworld. I tried with this piece to create something that had the appropriate amount of desolation to it. This music is where I really hit my stride as far as figuring out the structure of the music in the game. We had a short timeline to do a vertical slice of the game for a demo presentation, so I had to get to work without hesitation and build it gradually over time. The variations were heavily influenced by constantly cross-referencing with the labyrinthine map of levels that eventually became the mass of the South. The music branches, introduces new elements, and often removes old ones, in an attempt to stay on top of the feeling of each individual level. This is essentially the ending of The Gauntlet, split out into a separate track for listening reasons. The first section of The Sentients is the first boss track I wrote for Hyper Light Drifter and ended up seeing a lot of usages. There are 5 significant battles in the South which feature this music. The post-battle music ended up being an excellent title track, as it has a sort of chill, plodding quality that we found inviting. The final sequence is meant to capture the gravity of a significant encounter with a Titan. The root of this track was the very first piece written for the game, and remained largely unchanged in its final version, except mainly for the incorporation of the tower theme. It seemed appropriate to include this motif as it is meant to represent the technology, wisdom, hubris and ultimate downfall of the four civilizations. Chimera evolved fairly naturally out of this piece. The final boss music came together very late in the project. I didn't know what to write, and in fact felt quite intimidated because I knew it had to be climactic and surpass much of the music I had already written. Knowing this, but also knowing I did not have time to be precious and had to write because our time was almost up, I dove in and wrote very loosely, playing a lot with effects to try to create as gnarly a soundscape as I could muster. I came up with a sequence of ideas at the piano and recorded them in a somewhat lo-fi manner, with a field recorder. The general structure and ideas were there, but the specifics were always a bit blurry, and that allowed me to tinker with the form and the details of the performance over the course of a 10 - 15-minute jam. Afterward, I edited this down into a more listenable form, a six-minute track. This little ditty was pulled from the intro sequence and seemed like the perfect vignette for the death of the other drifter you encounter throughout the game. Native Instruments Massive. Massive is littered all across the soundtrack, and appears more than any other synthesizer. During the course of FEZ it became my new go-to synth, and I learned to create new sounds with it relatively quickly. You can hear the sound of Massive on tracks like ‘Beacon’, 'Compass’, and 'Legend’. I also managed to squeeze some pretty cool percussion sounds out of Massive. My favorite example is the big drums on 'Majesty’. Native Instruments FM8. One of my favorite synths, an excellent FM Synthesizer which can load up patches from pretty much any hardware FM synth ever made. All of the instruments in 'Nocturne’ were designed using FM8, and the synth also features prominently on 'Nature’. Native Instruments Absynth. All of the instruments (save the drums) in 'Adventure’ are patches I made in Absynth. I also reused and modified these instruments for use in some other tracks, like 'Home’. Sonic Charge Synplant. This is a pretty unusual synthesizer, not so much sound wise, but its user interface is unlike anything else you’re likely to find. 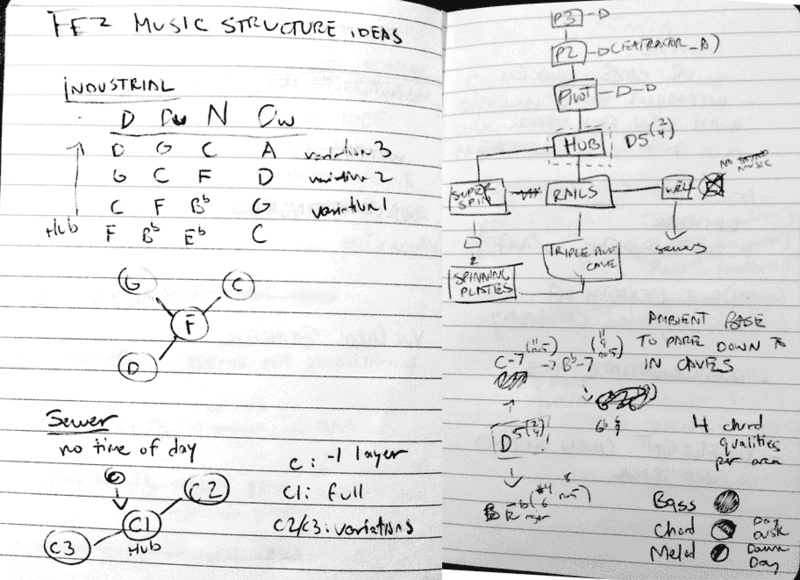 I used Synplant almost exclusively on a couple of the cues in FEZ, namely “Puzzle” and “Knowledge.”. There’s a more traditional set of parameters that can be adjusted under the hood, but the primary interface revolves around experimentation and moving tangentially from one sound to another. You have a seed that can grow in any number of directions, and each direction represents a different sound. You sort of mess with this to come up with new and interesting sounds, and you can theoretically generate a bunch of new patches in a very short time this way. Native Instruments Kontakt. Kontakt is king among software samplers, and has an incredibly robust feature set and an amazing community of third-party content creators. On 'Spirit’, I created a peculiar instrument using two SNES soundfonts, and a really neat Kontakt script by SonicCouture called 'Pentagonal Pyramid’, self-styled as a 'Black Key Harmonizer’. I also used Okedo Daiko samples on 'Fear’ to make the big chords more thunderous, and Double Bass and Tom samples on 'Loom’ (Available on FZ: Side Z). Native Instruments Reaktor. I used the Reaktor Ensembles SteamPipe and SteamPipe 2 on 'Flow’. These Ensembles are great for flute and other airy sounds. Lennar Digital Sylenth. This synth has a cool arpeggiator function. I think I only used it thrice though, in 'Continuum’, 'Love’, and for the creepy arpeggiator sounds at the beginning of 'Fear’. Native Instruments Battery. Used pretty much only for the TR-808 style drum sounds in 'Home’ and 'Adventure’. Propellerheads THOR. This synth is an old go-to favorite of mine. THOR has fantastic routing capabilities, so I ended up using it to create the arpeggiated 'rain’ in the second half of 'Fear’. This is the only instance on the soundtrack where I used an external application / sound source, rather than working purely within Logic Pro. THOR is a featured synthesizer in Reason. Adventure. This track is an anomaly; it’s the first track I wrote for the game, and I had experimented early on with running it through tape. I initially wanted to run everything through tape, but this turned out to be too impractical, because of the way we were syncing audio to things in the game (recordings on tape tend to fluctuate in tempo ever so gradually). Within a few days of meeting Renaud (FEZ evil genius programmer) in Montreal, I wrote this track. It represents my first feeling about how I thought the music in the game might sound. this was before any deliberation with Phil about the music direction, and it was inspired by some of the music concepts associated with FEZ pre-2010. Despite the majority of the music in the game being atmospheric, there are still a few spots where you will find some more upbeat, percussive tracks. If you look. Puzzle. this track evolved out of messing around with a new instrument I picked up at the time, called Synplant by Sonic Charge. It’s got a real unusual but ingenious interface... if you’re into synths I highly recommend checking it out. this song is a mockup of how the music behaves in the game. In game, this song is broken up into 27 individual assets, and plays phrases periodically, and moves through different keys depending on the time of day in FEZ. Beyond. I tried with this song to create the notion of a massive pulsating structure that controls and manipulates rather indifferently. Despite that, there is an upswing in the mood, because contextually, Gomez has really happened upon something special. The beginning sound, which is the sound of Gomez entering a special portal for the first time, is an attempt to capture a sound similar to that of the THX logo. That sound always gave me goosebumps. I feel lucky that creating that sort of effect these days does not require thousands of lines of code. Progress. the seed of this song is actually an idea for a piece of music that starts in a center location and expands out into 8 or 9 different directions. Each level would have its own key and as you move around this area the music would move with you. For the soundtrack edit, I tried to convey this same idea, where you’re surrounded by these machines that are in repetitive motion that evolves slowly over time. Beacon. this song started as two chords played while drinking a bit too much while trying to pronounce words in a Cantonese dictionary. there is a second version of this song that only plays at night, and you can only hear it in the game. Flow. I’ve always loved the idea of a track that starts as a single note, builds all the way up, and then crumbles back down to nothing. that was the idea here. I tried to make everything wet and airy to match the context in game. this is one of the few places where I use some more complex instruments, like synthetic flutes and tube percussion. Formations. I wanted to mimic the sound of water dropping from stalactites and other things happening in distant underground places. Legend. this track started as me messing with chords continuously moving up major 3rds, which is a sound I like. I tried to do something almost flute like with the melody. I think I was probably inspired a little by the Shire theme from Lord of the Rings. Compass. there was something about “Distant Worlds” by Sam Hulick (the map music from Mass Effect) that I always liked, and for some reason, I kept envisioning Shepard standing at that map screen in his ship when I was writing this track. It has a stability to it, like “Love on a Real train” by tangerine Dream, that I wanted. I also wanted it to feel really warm and sunny, and somewhat important. Forgotten. During the game, the music from this track takes on a different form, depending on where you are and what time of day it is. this version is edited down to incorporate portions of each. the “shaky” distortion present here is a result of modulating the amplitude of various parts with a noise signal. Sync. this one sort of just came out randomly. I was working on another track, and one of the ideas that I started vamping on was this riff. I held onto it and came back a year later to make it into a song. towards the end of the song you’ll hear some pulsing parts. I like to label those “Reich” in my song session (for Steve Reich). Glitch. this song is made entirely out of elements from other songs in the game. How many can you spot? Fear. this song is actually three separate cues in the game. I wanted to mimic the sound of a bunch of bats, and then I wanted to mimic the sound of rain and thunder. In game, the “thunder” strikes are programmed to trigger at a random time, to keep the player on his or her toes. Spirit. this song is composed almost entirely of black keys, which when playing by themselves, created a major pentatonic scale. the entire song is an improvisation, making sure to only play one note at a time. the other notes you hear are also black keys, but were added as a MIDI effect. Nature. this song uses a single instrument. During the day, critters scurry here and there, going about their business. But come nightfall, they come out to dance. the first section is a bunch of overdubbed improvisations, without tempo. Knowledge. this song is made up of a bunch of short parts in different time signatures. try counting them! Death. I originally came up with this melody on my Aunt’s upright piano during Christmas. then I recreated it with basic chord accompaniment using the keys on my laptop, while on a bus, headed from Boston to Hartford. I definitely tried to tap into the 80s horror mystique of bands like Goblin with this arrangement. Memory. this track is a foreshadowing, but it also has to do with something that already happened, so I was planning on calling it “Aftshadow”. But that sounds dumb. the game plays these phrases based on a random time scale, to help convey a sense of vague memory... something like saudade. Pressure. this is one of the more literal musical treatments. Do you feel hot? Don’t listen to this song if you’re in an oven. Don’t be in an oven. Nocturne. I’ve been sitting on this nugget for about 6 years. It started as the second half of a piano improv, where the first half sounded a bit too much like Beauty and the Beast. But I finally found a good place for it. the dungeon music from Legend of Zelda was always a favorite of mine as a kid. In an odd way this is sort of a tribute to that. Age. I wrote this song at a local game jam (tIGJam) for my friend Randy who was making a game about Sarajevo. But secretly I was experimenting with some early sonic ideas for what the game might sound like. I later revisited it, improved the structure a bit and added some lovely bitcrushing effects. It has this slow molasses feel to it, that to me felt like a really old, really abandoned and forgotten place. Majesty. the motif this song is based around was something I wrote down in a Reason file 5 years ago. I never expanded on it until I made this song. I really wanted to try to make acoustic sounding taiko-ish percussion using synths, and I think, relatively speaking, it worked out. If you’re wondering what memory “Memory” is about, this here might be it. Continuum. Phil had this idea to end the game with Moonlight Sonata, but I decided to go with my man Chopin instead, because I liked the movement of this song better. I worked from a MIDI file I found somewhere on the internet and spent a lot of time getting the pacing how I wanted. the arrangement does a lot to mimic what’s happening on-screen. Home. this track was heavily inspired by a certain strand of music from the demoscene, and a game called “Jasper’s Journeys”, which both use tracker software. In these instances, each note falls onto its own channel, and you are limited in how many channels are available. If you listen closely, you’ll notice that the arpeggio instrument that runs through the entire song, never overlaps itself too much, because it only ever allows 4 notes to play at once. this helps to keep things clear. Reflection. I wanted the moments after Gomez leaves his village to be reflective, so I continued with the Home idea, but stretched it out and tried to make it sound more solitary and inward. Ironically, this happens to be one of the longest songs in the game, but it only plays the first time you leave the village, and if you’re not totally horrible at platform- ing, you can get to the next area of the game way before the song is over. After working on Mini Metro, I was inspired to convert the basic idea of its music system into a MIDI plugin. That opened a floodgate of ideas and so I’ve been making lots of scripts in Logic over the last few months … I’ve been taking little clips here and there and thought I’d share some of what I’ve been working on !